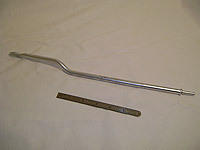 A client in the automotive industry approached Acme Screw Corporation in need of a custom metal formed steel rod link. We used both upsetting and extrusion operations, taking a .375" diameter shaft, upsetting was first performed to amass a .445" diameter by .575" long section of steel. The end was flattened and trimmed using an in-process induction annealing operation to reach our client's exact specifications. The opposite end was then double extruded to reduce the .375" shaft down to the .247" dog while upsetting a .530" diameter collar above the dog. Finally, we bent the part to the client's desired shape, and performed annealing. Maintaining tolerances of +.000/-.006", the finished 1010 steel rod link measured 14.418" with an O.D. of Ø1.022". To learn more about this project, or to find out more about our other products and services, please contact Acme Screw Co. Overall Part Dimensions Length: 14.418"